After 17 minutes England were 17-3 down and it was looking like a long afternoon for the near 82,000 Twickenham faithful. A sucker-punch try after only 108 seconds from Julian Savea, after a neat offload by the peerless Kieran Read, had opened the scoring, and when that man Read popped up again on the right flank to dot down after some bulldozing work in midfield by Owen Franks, it looked like another regulatory high-scoring win for a side that had only lost once, to England, since the 2011 Rugby World Cup. 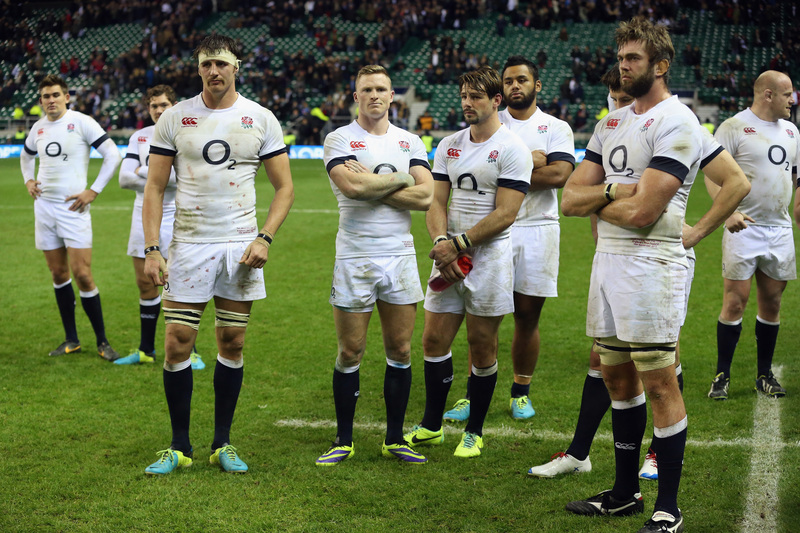 To their huge credit, England dug in and inched their way back into the game through Farrell’s boot. The scrum gained the ascendancy, Billy Vunipola smashed into heavy traffic like an oversize bumper car and encouragingly England’s midfield runners, in particular Billy Twelvetrees, ran with conviction. 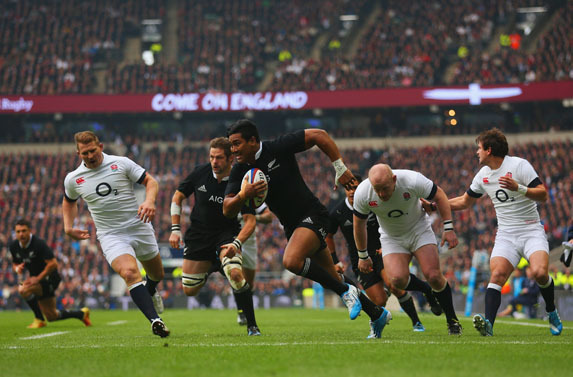 In defence, England also impressed, repeatedly clattering All Black runners backwards. They clawed the score back to 16-20 by the break, after Joe Launchbury had crashed over, this just minutes after Craig Joubert has disallowed an rolling English maul that had crashed over the line, much to the displeasure of the crowd. The second-half began without Kieran Read, who had been sin-binned for repeated transgressions at the breakdown, and England continued to push and prod to rattle the All Blacks. When Owen Farrell, who tackled like a Lion throughout, stuck the ball between the uprights on 60 minutes, it gave Lancaster’s men the lead for the first time, and the crowd sensed an unlikely victory. England had inched ahead by two points, going into the final quarter of the match, and had the upper hand in the game, but the All Blacks’ famed teak-tough mentality kicked in. A lost lineout by England was all they needed. Sensing an opportunity, they broke down the right flank, with young wing Charles Piutau going within metres of scoring, before the ball was quickly recycled in midfield. Ma’a Nonu, not famed for his deftness of touch, managed to slip the ball to Julian Savea, leaving the young Hurricane to bundle over from ten metres with three defenders hanging off him. It was New Zealand at their clinical best, and an clear example of what makes them the best team in the world. The New Zealand wing only turned 23 in August but in 18 Tests he has already scored crossed the whitewash 16 times. At 6ft 4in and nearly 17st, he is the prototype oversized modern Test wing, and though he is supremely powerful, his positioning, running lines and intelligence make him so much more than a battering ram. He only had two chances on the day and took them both, the first by being in the right place in the right time when Keiran Read bamboozled three England defenders, and secondly by being on the shoulder of Nonu. Elsewhere on the field he carried strongly, taking in defenders and carrying the ball 66 metres, the most by any New Zealand player. It was a performance that puts him in the top echelons of the game as one of the world’s foremost wingers. England: Brown, Ashton, Tomkins, Twelvetrees, Foden, Farrell, Dickson, Marler, Hartley, Cole, Launchbury, Lawes, Wood, Robshaw, B. Vunipola. Replacements: T. Youngs, Mullan, Wilson, Parling, Morgan, B. Youngs, Flood, Goode. New Zealand: Dagg, Piutau, B. Smith, Nonu, Savea, Carter, A. Smith, Woodcock, Mealamu, O. Franks, Retallick, S. Whitelock, Messam, McCaw, Read. Replacements: Coles, Crockett, Faumuina, Romano, Luatua, Kerr-Barlow, Cruden, Crotty.